I feel gifted to have access to so many fantastic teachers when I train in Japan. But I feel even luckier when I have two classes in a row with the same master. That was the case yesterday as Senō sensei opened the Sunday training after teaching us on Saturday. When we teach, we often keep unfolding the same idea over a few classes. The Japanese Dai Shihan do the same. Yesterday, Senō sensei continued with the Binkan concept (1) he taught on Saturday. Budō is about developing this sensibility in the middle of the encounter. When your six senses are in tune with the opponent, then your body reacts without thinking. This sensitivity begins with your ability to detect the enemy with your skin, binkanhada (2). This is why when we move we have to keep the body relaxed. The less tension we put in the body, the better we feel the other’s intentions. When this feeling extends to the whole body, this is Taikan (3). Taikan doesn’t only concern the bodily sensation; it is also the result of your experience. We know it because all of us have already experienced it before. The more you train, the better you can “sense” uke’s movements. Sometimes it feels that time is slowing down. This ability to sense the opponent doesn’t come overnight. It is something, like the Sakki test, which builds up gradually. One day you have it. It is something you acquire with consistent training and study. Some practitioners will develop it in twenty years, others in thirty years. 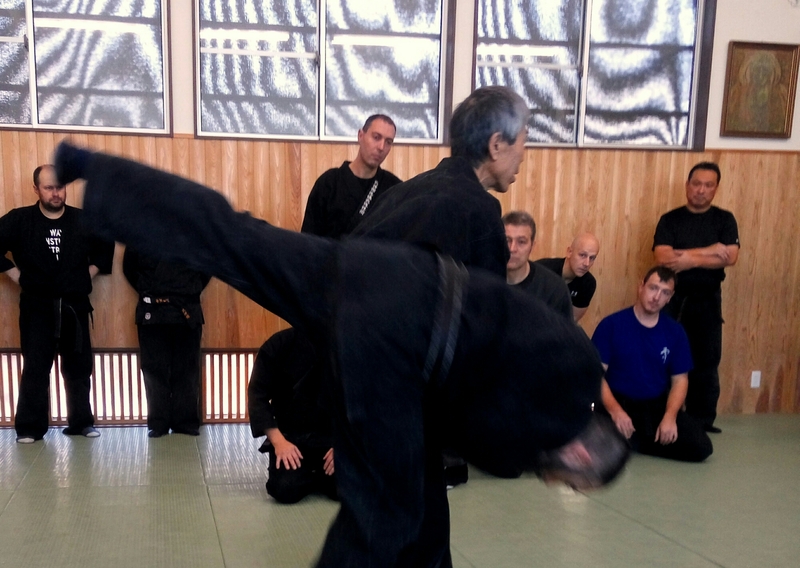 But at some point, I believe that everyone training seriously within the “Bujinkan borders” will get it (4). At the end of the class, Senō sensei explained that in the time and space where the exchange is happening, Uke and Tori are exchanging: this is Kawasu (5). I see Kawasu be similar to modern chatting. When you chat with a friend, each one writes in turn, and exchange ideas. But as you have all experienced, due to the speed of writing, there are moments where ideas get mixed up. Your answers come too late; your correspondent is already speaking of something else. And it gets hard to follow. – uke: how are you? – Tori: excellent. What about you? – uke: I’m going shopping. – tori: maybe we meet there? – uke: I had a bad night. – tori: I must get some fruits. – uke: I think I ate too much yesterday. – tori: I have to eat healthier. – uke: no, I meant when do we meet? At some point, each one is following his train of thought and doesn’t listen to what the other is writing. The same thing happens during the exchange/fight with the opponent. If Uke attacks, we should not try to put our intention in the exchange, but sense him with Taikan, and go with the flow until we can defeat him. Kawasu is an important part of the fight and will benefit us, as long as we don’t try to impose anything on the opponent. As Hatsumi sensei says “be zero, don’t do a technique. Anyone can do a technique and therefore, becomes visible. Be unexpected”. The best way to be unexpected is to develop sensibility. 4. Bujinkan borders: to me, the Bujinkan is a complete system that doesn’t need extra “add-ons” from other fighting systems. Teachers that are adding MMA, or sports-like techniques to the Bujinkan syllabus, are missing the point. The Bujinkan is perfect in itself, anything you add, proved your lack of competence. Would you put a Mp3 player inside a guitar? No. Don’t cross the “border” before you understand all that you have to understand. I really like what you have to say about what you call “Bujinkan Borders”. Allot of practitioners will attempt to supplement their training with outside influences not realizing that what they seek is already within their reach if they’d only reach out to their fellow Buyu. I think your openness to the Bujinkan community has helped allot of people realize this. I’m very thankful for your presence within this family and all the insights you share and propose.